Do you enjoy eating fresh packed sandwiches full of flavor, as well as a variety of different unique options to try from? If so, you must check out Capriotti’s Sandwich Shop & I have great news for you because in this post I am going to tell each and every one of you how to claim your FREE sandwich! There are no strings attached…just a simple text message…Read on my friends! The one and Only Bobbie Sandwich – It is like Thanksgiving! 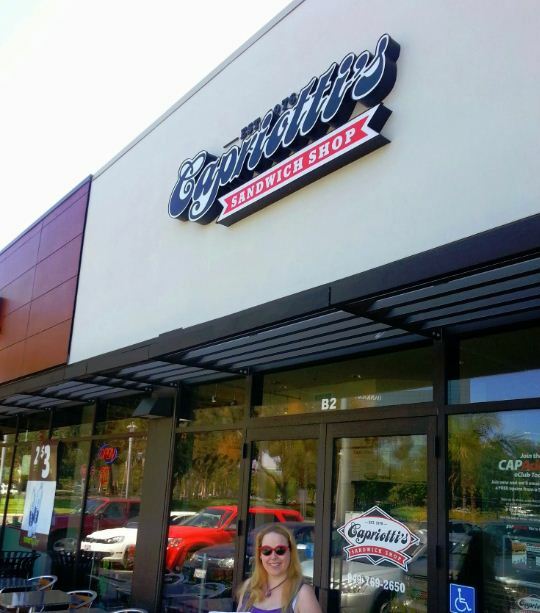 To celebrate the new restaurant, Capriotti’s is also offering 10 fans the chance to win a free sub per week for a year by texting FREE SUBS to 25328 until January 31, 2013. Winners will be notified via text by February 5, 2013 as to if they won. Just for entering the contest, the location will also offer all who enter a FREE SANDWICH at the new Irvine location by showing their confirmation text message for up to three days after receipt. Yes, that is right my friends, EVERYONE gets at least one FREE SANDWICH! In addition to the FREEE Sandwich everyone can get above at the NEW Irvine location and the opportunity to win a free sub every week for a year; I am also doing a giveaway for a 9” sandwich at any Capriotti’s location, so enter my contest here! 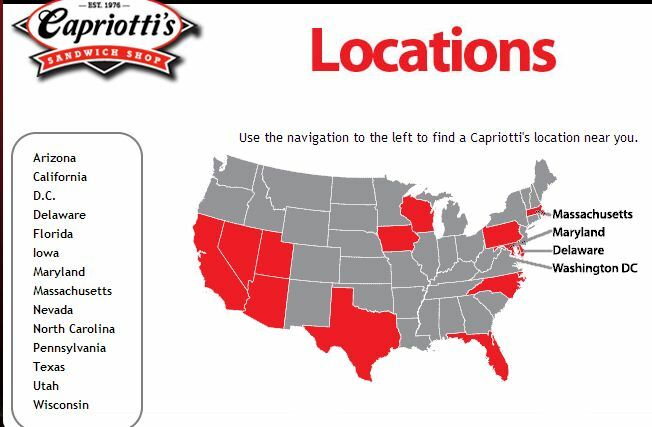 Locations of Capriotti’s include all of these different states: Arizona, California, Nevada, Texas, Washington D.C., Delaware, Florida, Iowa, Maryland, Massachusetts, North Carolina, Pennsylvania, Utah & Wisconsin so be sure to share this contest with your friends!!! I recently went in to check out these sandwiches myself and I wanted to share my experience with two of the sandwiches we ordered. 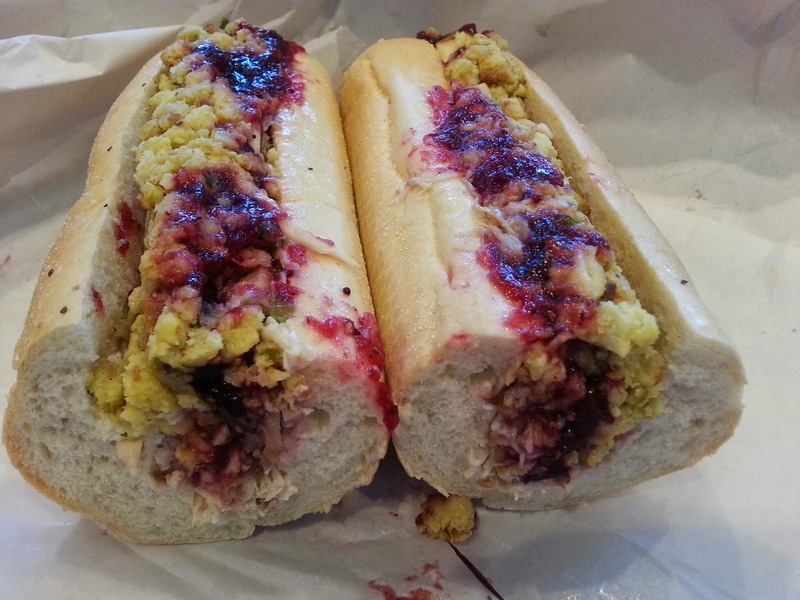 My husband and I tried the Famous “Bobbie” Sandwich that totally reminded me of Thanksgiving! 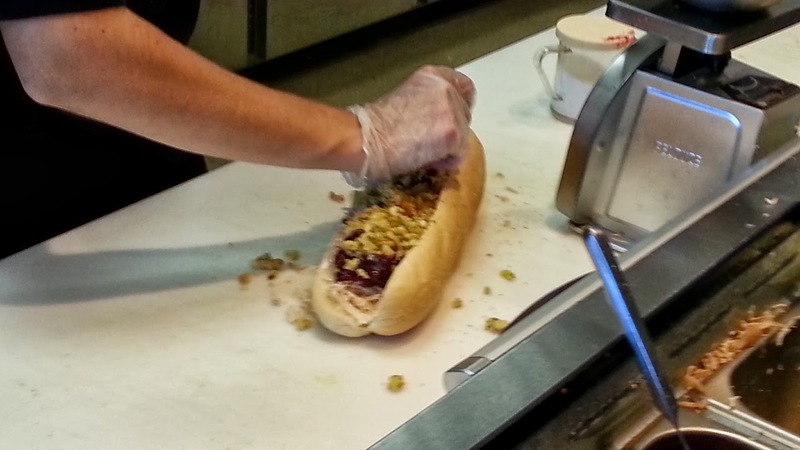 It is very unique in flavor and the ingredients include; Homemade Turkey, cranberry sauce, stuffing, and mayo. Seriously, even though it is January I was already missing Thanksgiving when I took a bite out of this sandwich! The other sandwich he had was the Capastrami which was filled with hot pastrami, Swiss cheese, Russian dressing, and cole slaw.Yuuummm!! My roots are from New York, so I love a good pastrami sandwich! We also had a bag of Wise potato chips which made me crave the East Coast…ok well maybe not during the Polar Vortex… 🙂 Let me know below what you think of Capriotti’s and don’t forget to text to get your FREE sandwich before January 31st & enter my contest to get your FREE Sandwich at ANY Capriotti’s location! Thanks Jo:) Glad you enjoyed! It makes me want to find one in my area! Thanks! What’s that purple stuff in the sandwich? Sounds like a great deal to me…I’m in! Oh no, a free sub a week for a year. To bad i don’t live in the area. looks like a creative sandwich, thanks so much for the post! You are so very welcome Jessica:) Thanks for the comment! These remind me of subway but much better! I wish I could try one! Is that corn, cranberry and the works on that sandwich? Thank you for sharing this post! Wow great contest. Wish there was one where I live! I got the free sandwich here yesterday, employees were friendly, thank you! I have heard of this place in Las Vegas. I didn’t know we had them here. Thank you for sharing. 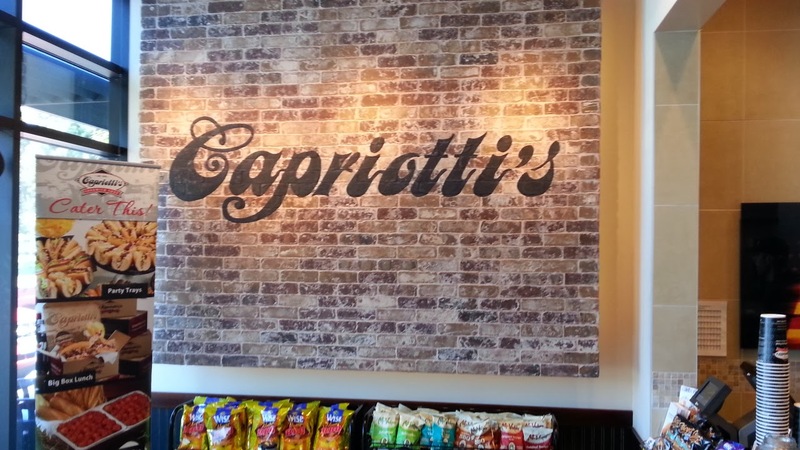 I freakin love Capriottis! My fav is the Cole Turkey. I haven’t been, but that Bobbie sandwich looks DELICIOUS!! They all look good but I have a weakness for Italian subs. Gotta try ’em wherever I go. Never been but the Bobby sounds like my kind of sandwich. Wow sounds like a great place! I have never been but now realize there is a shop in my area. I would like to try the Veggie Turkey.